Partick Thistle believe they are on the verge of building “something really special” after handing manager Alan Archibald a new long-term contract. Archibald, the longest-serving manager in the Ladbrokes Premiership, has signed a three-year contract along with assistant Scott Paterson. The new deals are a symbol of the club’s faith in the pair given Thistle have still to secure their top-flight status for next season. 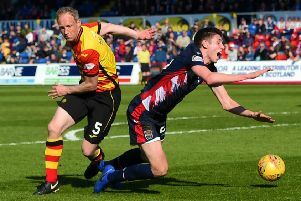 After being an equalising goal against Ross County away from making the top six, another two defeats have given Kilmarnock the chance to cut the gap on the Jags to three points on Saturday in the race to avoid a play-off. But chairman David Beattie believes Archibald and Paterson will only take the club in one direction. The former Thistle and Dundee United defenders led the club to promotion in 2013 several months after taking charge when Jackie McNamara left for Tannadice. Beattie told the club’s website: “Alan and Scott have done an incredible job since taking over midway through our promotion season. “Every season since, we have challenged them to drive the team forward and achieve more in the league with what other teams would regard as restricted resources - and every season they have achieved what we have asked of them. “Undoubtedly there have been bumps in the road, but both Alan and Scott have taken everything in their stride and risen to the challenges very effectively. “No-one should be in any doubt that Partick Thistle means business. Following three and half years of constant progress, growth and development, we are now in a stable position to build something really special here over the next three seasons. Managing director Ian Maxwell, a former St Johnstone, St Mirren and Thistle player, has also committed himself to the club for at least three more years. Beattie added: “He has done a tremendous job over his time here and was central to us being able to go debt free early in the season. With that experience, it is crucial to us that we keep him to ensure that we maintain our financial stability going forward.